If you were asked to imagine a landscape inhabited by carnivorous plants, you might envision some primeval jungle of contorted vines and fearsome beasts. In reality, unless you live on a research station in Antarctica, chances are that some ferocious flora is growing very near you. An expedition to see wild carnivorous plants in New York City, for example, could consist of a free ferry ride to Staten Island, where the spoonleaf sundew (Drosera intermedia), with its glistening “sticky-trap” leaves, can be seen at Clay Pit Ponds State Park Preserve. Several aquatic carnivores of the genus Utricularia also grow in the kettle ponds that dot the borough. Far from being delicate, tropical novelties, many carnivorous plants grow well in the New York City region, and they can be easily cultivated outdoors in most parts of the country in USDA Zones 5 through 10. 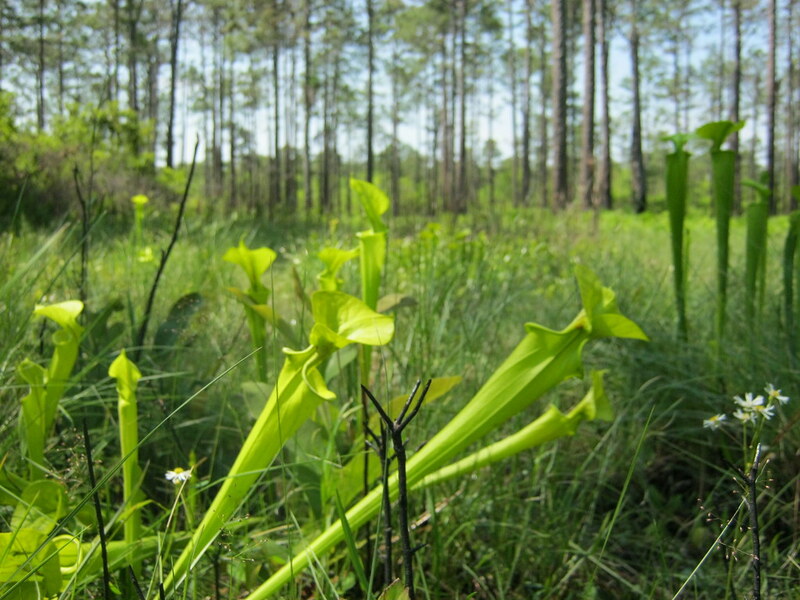 In the wild, most carnivorous plants grow in sunny, acidic, nutrient-poor wetlands called bogs. Home gardeners can replicate this environment in a mini-bog planter and grow a diverse array of species like sundews, pitcher plants, and butterworts. You can also include orchids and other noncarnivorous wetland plants to build a fascinating miniature habitat. There's no need to hand feed your carnivores—insects will readily come on their own. 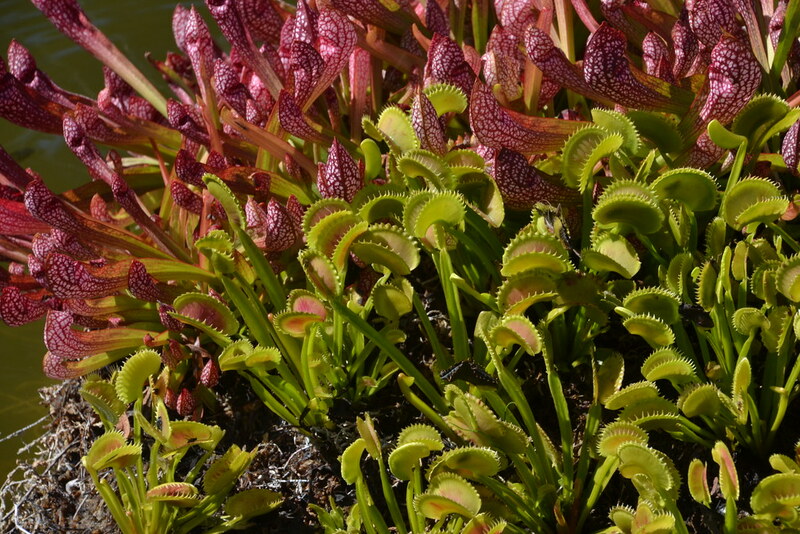 Expect to see houseflies and wasps fall prey to your flytraps and pitcher plants. 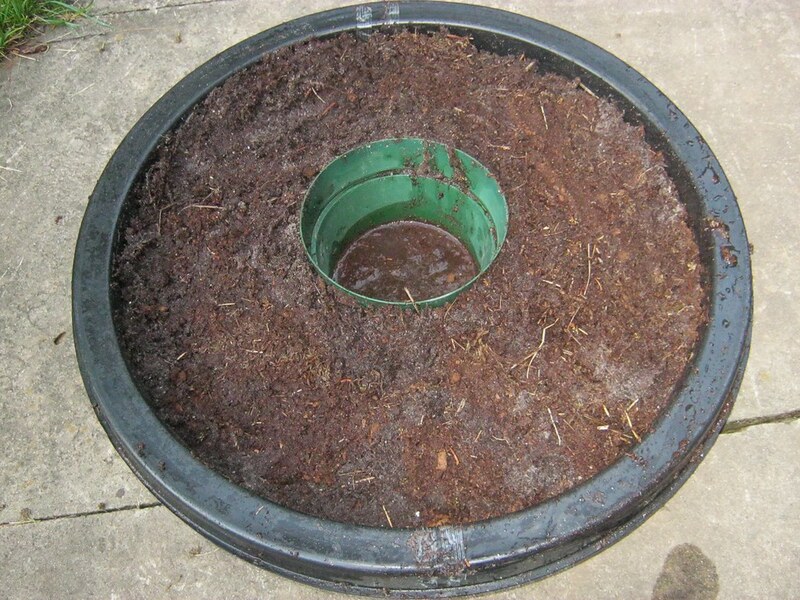 Below are instructions for constructing a mini-bog using a basic pond liner from a home-improvement store, but you can adapt the idea to other containers too—almost any plastic or metal container without drainage holes can be used to replicate boggy conditions, from a window box or flowerpot to a more idiosyncratic vessel like a salad bowl, tool box, or even an old rain boot. Plan to keep your mini-bog container outdoors in a sunny location for most of the year. Carnivorous plants Select species that thrive in your climate and site conditions (see below for more details). Rigid high-density polyethylene pond liner, with no drainage holes One choice is a MacCourt 9-gallon black liner, 26 inches wide and 7 inches tall, which can be purchased at Lowes or another home-improvement store. 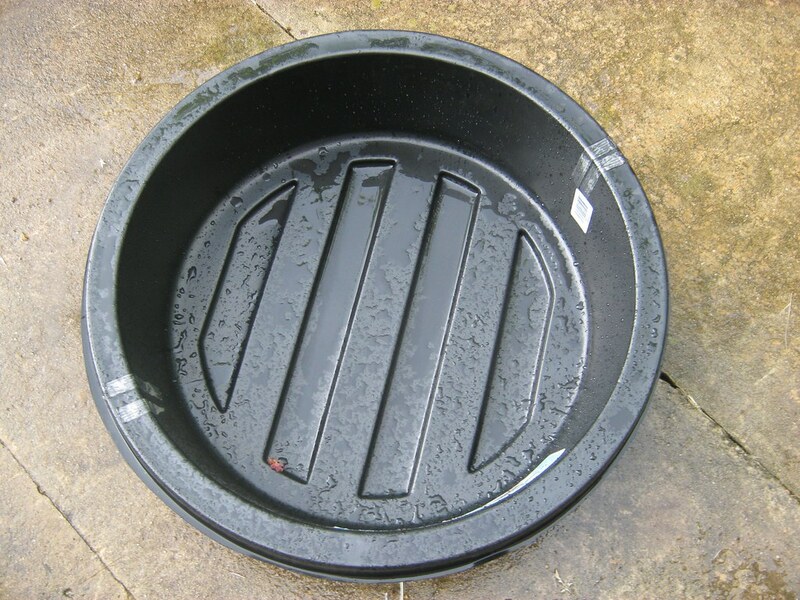 Round plastic nursery plant pot (approximately 6 inches tall and 10 inches wide) This pot must have drainage holes. 1-cubic-foot bag of sphagnum peat moss The packaging must literally say “sphagnum” peat moss. Sedge peat and sweet peat are not acceptable. It should not have any added nutrients. 40- to 50-pound bag of horticultural sand or washed play sand Do not use paving sand or sand from a beach. 100-cubic-inch bag of fibered sphagnum This is simply dried sphagnum moss. Optional top-dressing materials Try pine straw, pine bark, live sphagnum, and/or quartz gravel. Fill the bottom two inches of the pond liner with crushed lava rock for drainage. Place your plastic nursery pot in the center of the pond liner. You will keep this pot empty and fill the container around the pot with soil. 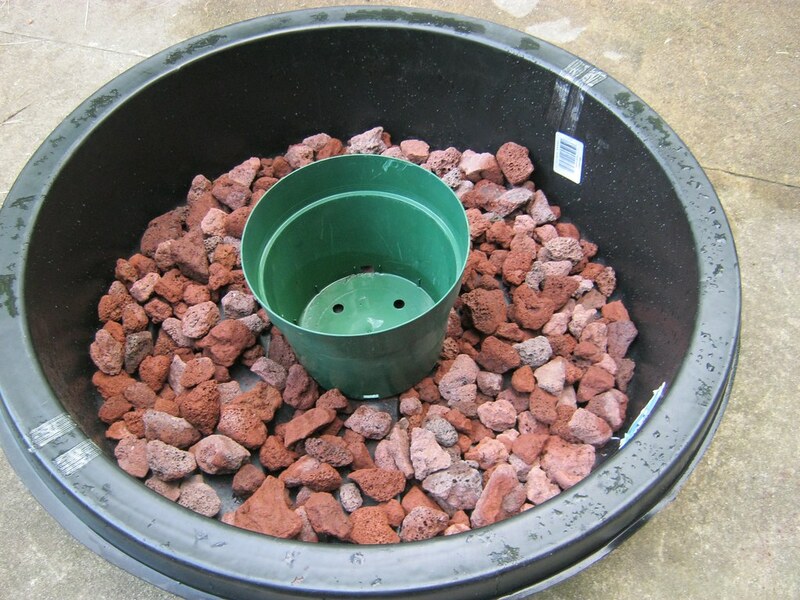 Once the mini-bog is complete, you will fill this pot with water, which will slowly drain out into the pond liner to bottom-water your plants. 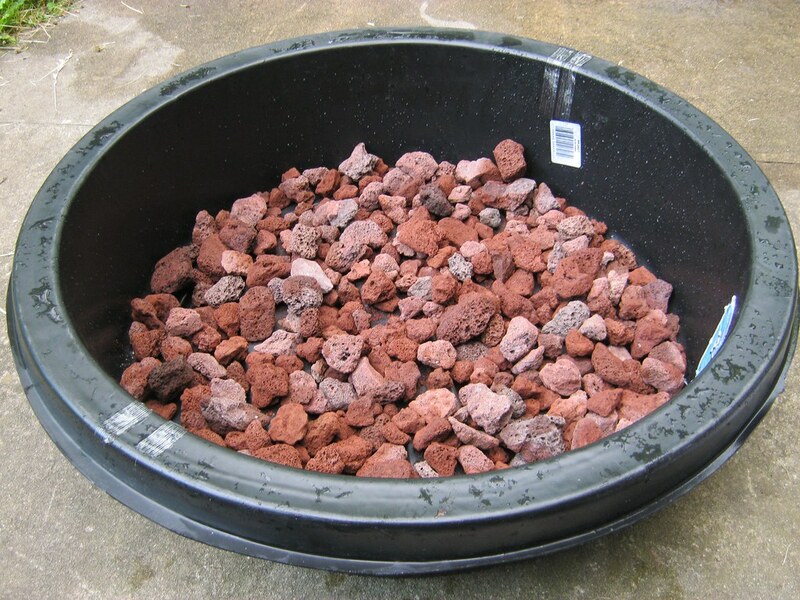 This allows you to avoid top watering, which can disrupt small plants and compact the soil. The pot also functions as a bog-garden reservoir, reducing the need to water as frequently. Simply refill the pot when the water level drops to its bottom. Create your growing medium by combining 50 percent sphagnum peat moss, 30 percent horticultural sand, and 20 percent long fiber sphagnum moss and saturating it with water until it has a mudlike consistency. 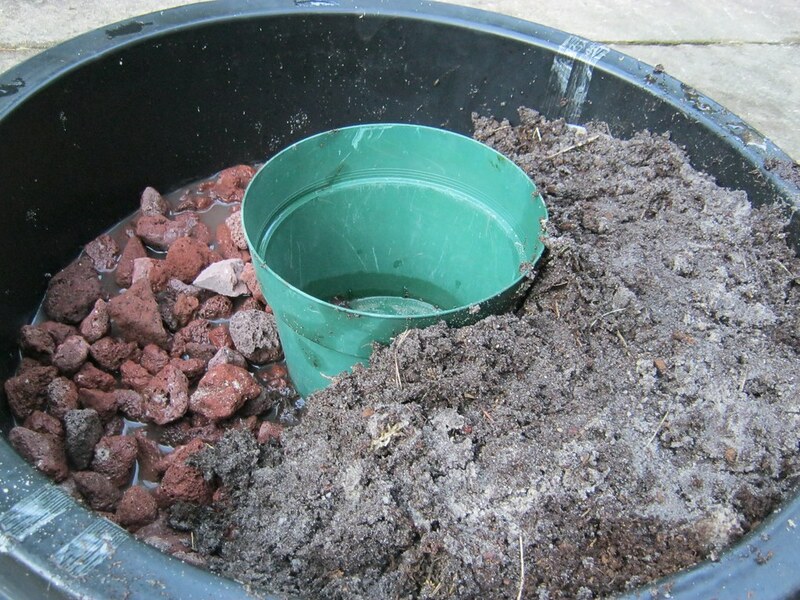 Fill the planter (outside the plastic pot) with the soil mix. If your mini-bog is to be viewed from all vantages, consider building the soil level higher toward the middle of the pond liner for visual appeal. Or vary the depth of the soil and then plant the lower areas with more flood-tolerant species like spoonleaf sundew and parrot pitcher plant (Sarracenia psittacina). Higher areas can be planted with less flood-tolerant species like Venus flytrap (Dionaea muscipula). Your mini-bog can include a mix of carnivorous plants and other species that thrive in bogs. When choosing carnivorous plants, cold hardiness is your biggest concern. If you live in Zones 7–10, you can grow Venus flytraps, most American pitcher plants (Sarracenia species), and most temperate and warm-temperate sundews (Drosera species) and butterworts (Pinguicula species). 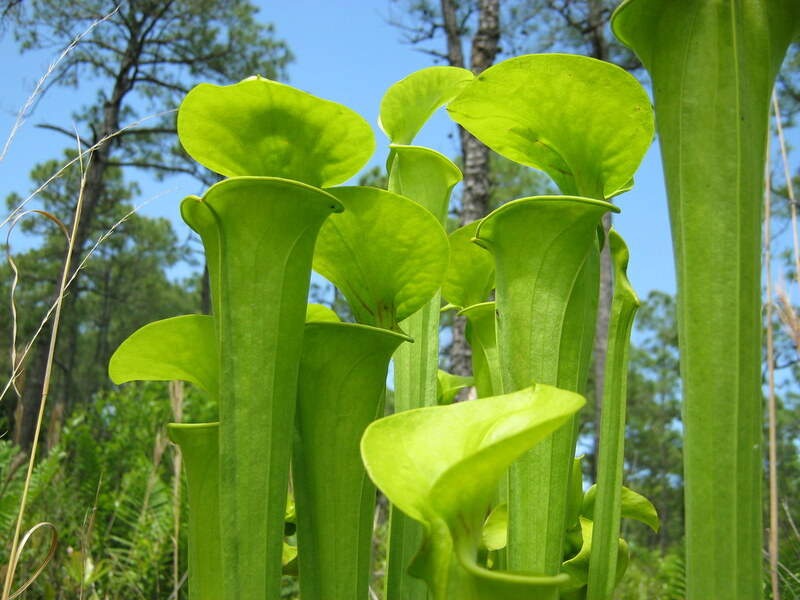 If you live in Zone 6, focus on plants from the Carolinas and farther north, like trumpet pitcher plant (Sarracenia flava), sweet pitcher plant (S. rubra), and purple pitcher plant (S. purpurea). If you live in Zone 5 or colder, you are limited to very cold-tolerant plants like the northern subspecies of purple pitcher plant (Sarracenia purpurea subsp. purpurea), round-leaf sundew (Drosera rotundifolia), English sundew (Drosera anglica), and common butterwort (Pinguicula vulgaris). Regardless of your climate, there will be no shortage of options for beautiful bog plants to accentuate your carnivores. A succession of orchids is one great option and will add seasonal interest. Try grass pink (Calopogon tuberosus), which blooms in spring to early summer, followed by the late-summer-blooming nodding ladies' tresses cultivar 'Chadds Ford' (Spiranthes cernua var. odorata ‘Chadds Ford’). Once you have selected and acquired your plants, think about placement. If your mini-bog will be viewed from all sides, you may want to plant your tallest species toward the center and then terrace down to shorter plants. If it's to be viewed primarily from one side, plant your tallest species at the back and install shorter plants in the front. Once you have installed your plants, you can top dress your mini-bog with pine needles, pine bark, quartz stone, or live sphagnum to add a sense of realism and protect your plants from the impact of heavy rain. Top dressing may also help protect your plants from marauding squirrels and birds. Water quality is always an important concern when growing carnivorous plants. Unless you live in a city like New York, where the tap water has less than 100 parts per million dissolved solids and a pH lower than 8, you should only irrigate your mini-bog with distilled water, reverse osmosis water, or rainwater. When watering the mini-bog, fill the reservoir pot to the top and then let the water level drop to near the bottom over a period of days, so that oxygen can periodically permeate the soil. If you live in a very rainy region and you find that the mini-bog is constantly flooded, drill some holes in the side of the container about an inch below the surface of the soil to allow drainage. Your mini-bog must be positioned where it will receive at least five to six hours of direct, unobstructed sunlight. For most carnivorous plants native to the United States, a winter dormancy period is required for long-term survival. If you are growing plants not winter hardy in your region, you may need to shelter your mini-bog during the winter while still allowing the plants to experience natural dormancy. At the outset of freezing temperatures, move the mini-bog to a sunny glassed-in porch or a windowed basement where it will be cool but protected. Alternatively, leave the mini-bog outside, but bury the pond liner so that its surface is at the same level as the ground, and then mulch the top with two to three inches of pine needles, oak leaves, or straw. Once established, your mini-bog will require minimal maintenance. Just weed and water the container, and you can expect your mini-bog to last for years. Flies and wasps, beware! For additional information on growing carnivorous plants, Brooklyn Botanic Garden will offer the workshop Cultivating Carnivorous Plants on July 30, 2016, instructed by Will Lenihan, who wrote this article. Will Lenihan is an assistant gardener at Brooklyn Botanic Garden. NEVER, EVER use oak leaves as mulch or “top dressing.” Oak leaves are poisonous to carnivorous plants, as they emit chemicals that inhibit growth of anything but its own oak seedlings. In cold winter snaps (below 20°F), use small Christmas lights laid on top of and around plants and cover. They emit just enough heat to prevent freezing. I live in Brooklyn and have a sarracenia purpurea, sundew, and nepenthis growing on my window sill. The temperature is about 60 degrees. Should I move outside into my shed at this point? It would not get any sunlight in the shed. James, I bet those larvae are mosquito larvae. I don’t think they’ll hurt the plants, but who wants to breed mosquitos?! Maybe netting over the reservoir would prevent them. I built this exact same bog garden and it is thriving. However my water reservoir has small larva swimming in it. I was wondering if that was normal and if not, what do i do ? Honestly, again thanks for posting such great information! Interesting plants and I am looking forward to giving them a try here in my own garden in Boston. Where do I obtain some of these bog plants for northern climates such as Zone 4? How to winterize my small portable bog garden? I have pitchers, sundews, and cranberry, in a 3 x 2 foot plastic container. Should I cut back pitchers, etc.? Place in unheated garage? Place in basement with sunny window? Appreciate any advice. 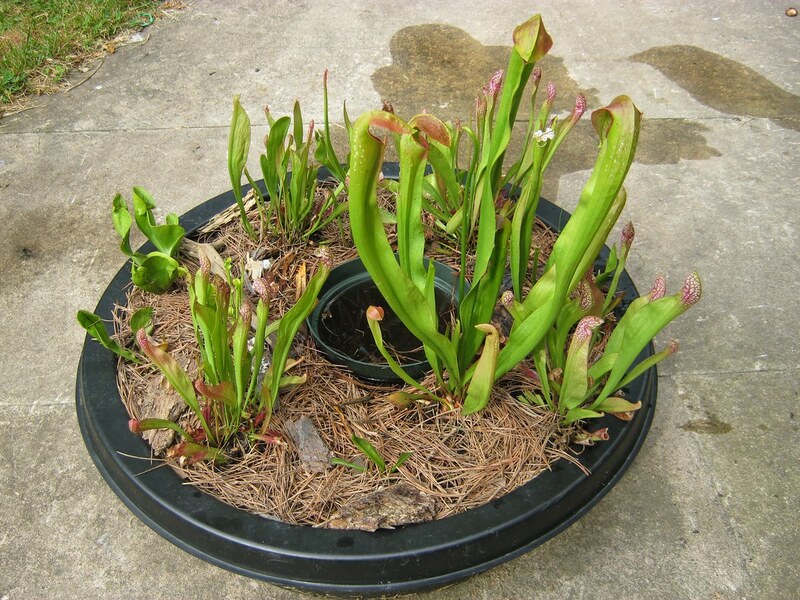 You will always have to weed the container that you grow your carnivorous plants in, but you can suppress weeds to some extent by top-dressing the soil with an acidic mulch like pine needles or pine bark. You could also plant your container very densely, using carnivorous plants and other desirable bog accent plants as a kind of living mulch. American cranberry (Vaccinium macrocarpon) can function as a groundcover to suppress weeds because it will spread relatively quickly under acid-bog growing conditions. I have tried several times to grow carnivorous plants using the recommended medium, water, and sunlight conditions, but repeatedly the carnivorous plants get overrun with local native plants. Is weeding a regular problem when trying to grow them outside? Any recommendations or advice? Just for absolute clarification: is the entire “Overwintering” paragraph about “not winter hardy” plants, or do those wintering instructions apply to all pitcher plants? I am interested in keeping winter-hardy species on an NYC terrace and will be unable to bring them inside, or bury the container. Are these steps unnecessary for the hardiest species? Well written, easily understood and helpful to this novice. Thank you for your assistance. A rigid pond liner is perfect for making a mini-bog. Photo by Will Lenihan. 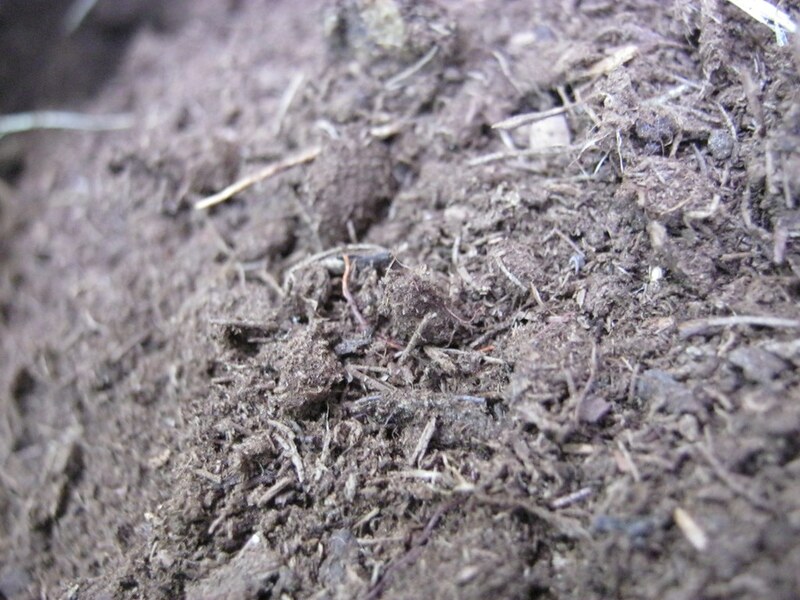 FIbered sphagnum (dried peat moss). Photo by Will Lenihan. 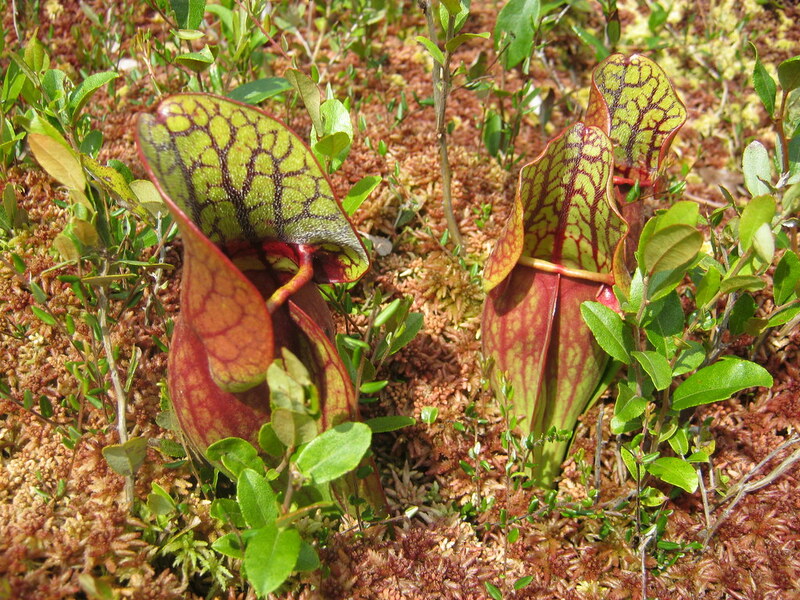 Pitcher plants growing in the wild in a natural bog in North Carolina. Photo by Will Lenihan. Sarracenia flava (trumpet pitcher plant). Photo by Will Lenihan. Sarracenia purpurea (purple pitcher plant). Photo by Will Lenihan. 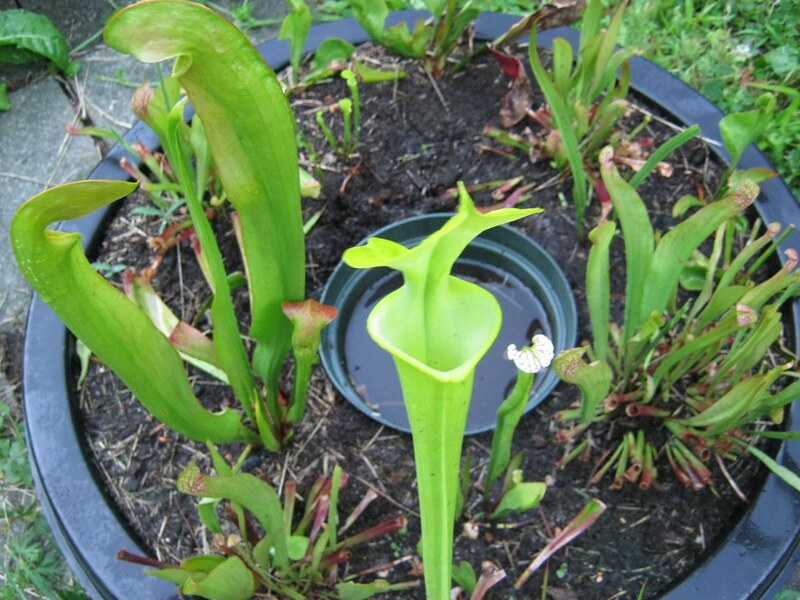 Carnivorous plants like pitcher plants can thrive in a simple container garden in most parts of the United States. Photo by Will Lenihan. Sarracenia (pitcher plant) cultivar and Dionaea muscipula 'Dentate Traps' (Venus flytrap cultivar) on display in Jenkins Fountain on BBG's Lily Pool Terrace. Photo by Elizabeth Peters. 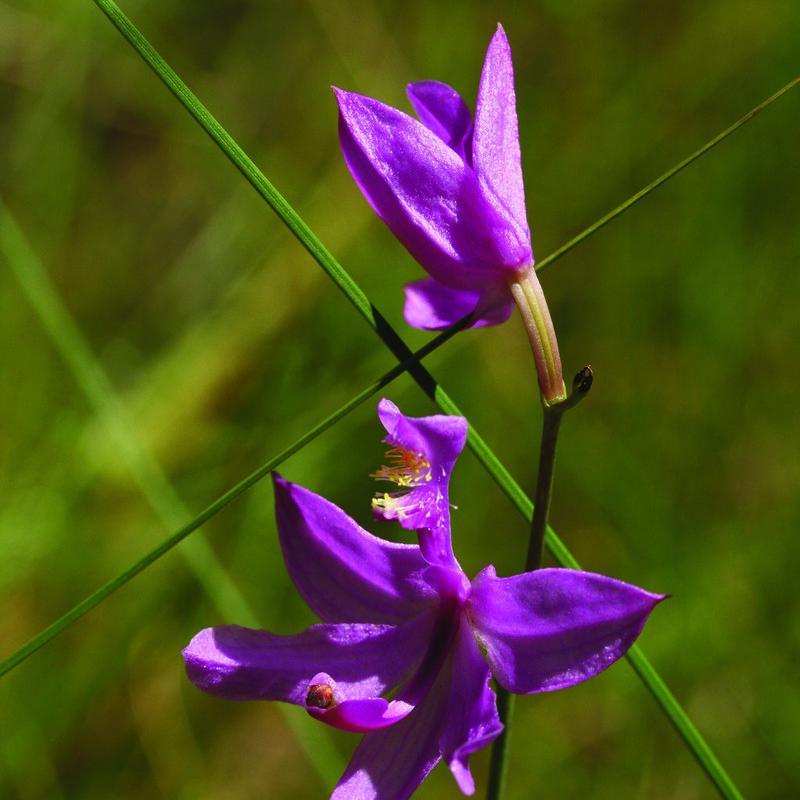 Calopogon tuberosus. Photo by Uli Lorimer. Once complete, you can keep your mini-bog on a patio, in a small yard, or even on a rooftop. Photo by Will Lenihan.